The monster inside me has awakened once again. My dark passenger, who so often is so passive that I think I got rid of him, is in fact still with me, and always will be. That's the thing about depression: You don't really lose it. You can learn to deal with it, you can take medication, go to counselling, meditate, do yoga, do the list of things you wrote down to pull out in times just like these. And 95% of the time they work, and you are doing fine. The last two days I was experiencing the other 5%. A potent mix of PMS, an unresolved conflict that's weighing on me, some self-induced stress and my inherent depression combined to give me a severe case of vertigo on Thursday and an intense crying spell yesterday, physical manifestations of the sadness inside me. I love my life, and I know that I am loved. And still, these episodes are part of my life, and I had to learn to accept that. I used to try so hard to will them away: ignore the problem, pretend it doesn't exist, and it will go away? Wrong. It didn't. So I changed my tactic to something dangerous: Blame my sadness on someone else. During my teenage years I would attack my sister and parents, and later my husband. Very unhealthy, terribly unfair and, as you can imagine, a heavy burden on the relationship. If it would have gone on, it could have destroyed my marriage. Since my official diagnosis almost 3 years ago I have abandoned that strategy, to Rich's immense relief. As you may know, Kino MacGregor is a huge role model for me. I follow her on Instagram, not only for her beautiful yoga poses, but also for the positive and empowering words that accompany her photos. Yesterday, when I was feeling sad and depressed, I happened to find a video of her where she shares her own experience with depression. Talk about perfect timing! If you have 8 minutes, watch it - it really helped me feeling so much better. Her description of depression is spot on: "There was nothing crazy that precipitated these periods of depression. It was just the seed that was there inside of me." "I had times in my life where I felt like I had tripped and fallen into a black hole so deep that no light could possibly shine." "I lost faith and I lost hope in myself, and I wondered if I would ever have something valuable to give again." "It was because I was empty inside that I was looking for things outside of myself to stuff in and try to fill me up and make me a whole person." 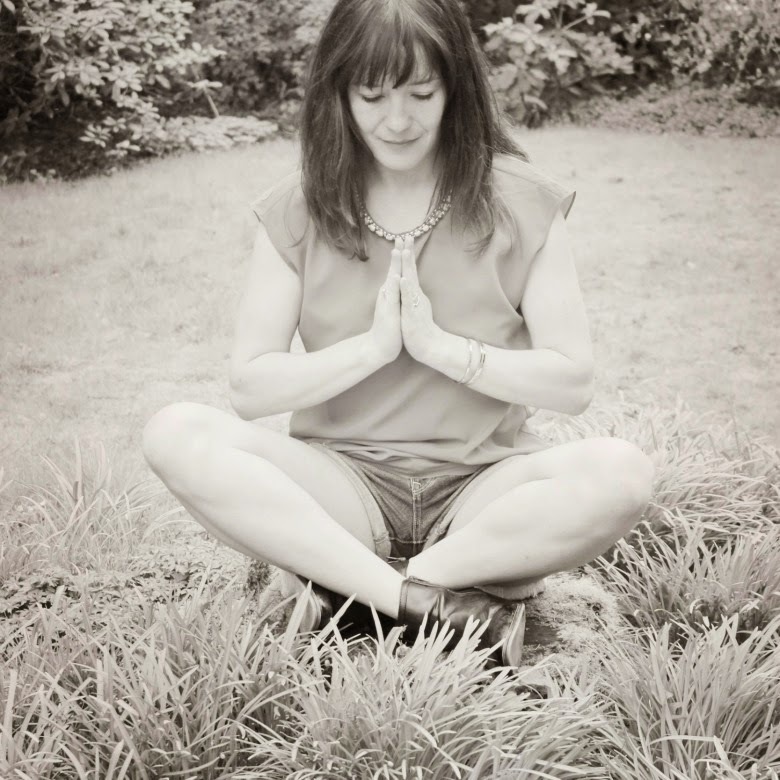 Yoga helped her find fulfillment and happiness inside of herself. I'm still on the path of figuring out exactly how to successfully deal with depression, but it's getting better. So much better. What I have learnt is not fighting it when it surfaces. I try to do all the things that make me happy: cuddle my dogs, hugging my husband, eating chocolate, yoga, going for a walk, reading a funny book. But I also let myself feel the sadness. Trying to avoid it was so exhausting and ultimately pointless, so now I ride it out. I let the sadness engulf me, feel all.the.feelings, and let the tears flow. Because I know that it is just a black cloud that will pass through, leaving a brilliantly blue sky in its wake. The reason why I'm sharing this on here? Because I want you to know that you are not alone. Seeing all those smiling faces and happy moments in people's social feeds may make you think you are the only sad person in the world. It's not true. Behind every smile you see is a person that's sad, hurt, lost, afraid, insecure. Never forget that. Hiding my depression for so many years was hard. Keeping up a lie on top of having to deal with the sadness was a heavy burden. Talking about it openly has been such a liberating experience! Never feel ashamed of it if you have a mental illness. We didn't choose it, it chose us. But how you deal with it is up to you, you are not powerless! I still take medication, and have no plans to change that any time soon. It is what helped me, combined with the other coping effects mentioned above. If you feel like you may have depression or another form of mental illness, go and talk to someone about it, seek help, open up. I promise, it will set you free. I feel like you are describing me perfectly...however, I had a poor experience being forced to a counselor when I was younger so now I just feel the need to avoid confronting the emotions. Mark is a saint for tolerating me. I was overwhelmed with an intense feeling of "the universe aligned and is looking out for me" when I found Kino's story on depression. As you may know, I have fangirl tendencies, and I'm a huge fan of hers - I love her IG account, her YouTube videos, her smile and positivity. Hearing her dealing with the same illness was sort of incredible. But that's the thing about mental illness: it is invisible unless we choose to openly talk about it. I don't want people feeling sorry for me, because I'm taking medication, have a healthy support network, and am now practicing yoga! :-) But I want other people with depression, anxiety and all the other forms of mental illness to not feel alone. That's the worst about it: The feeling of isolation. Let's start to openly talk about it, take the stigma away and support each other! Oh, I know where you are at, I have been there thousands of times!! It took me 18 (!) years before I finally spoke to a counsellor about it, and only on the insistence of my husband who was worried that my depression may actually destroy our marriage in the long run. I'm so sorry that you had a bad experience! How devastating. Just know, you are not alone. When I first wrote about it (about 2 years ago) I had several people come up to me and tell me that they were going through the same thing, taking medication, etc. People I had been working with or known for a long time, and I had no idea! It would have helped tremendously to know that in all the dark times I had suffered through over the years. So next time you are in that black hole? Think of your friends, co-workers, casual acquaintances, and KNOW: at least a third of them have experienced some form of what you are going through right now. YOU ARE NOT ALONE! I agree this should be talked about openly! Kino is great for her openness and honesty. I am glad that you find support in her words. I hope you have a Happy Mother's Day. Hugs to you, my friend! You are inspiring and strong and awesome. Thank you so much! Depression is by far not the worst thing to have, and I consider myself very fortunate. Knowing that the sadness will go away again is important, and it always does. But what helped me the most was realizing that I'm not alone! That's why I share my story. I never get tired of reading about folks who deal with their depression in healthy, constructive ways. Here's to fighting the good fight! Thank you so much Karen! You put it perfectly, "fighting the good fight". That's what it is! It may not always be easy, but I'm assembling more and more tools to deal with it. I hope other people with depression are getting a good collection, too!